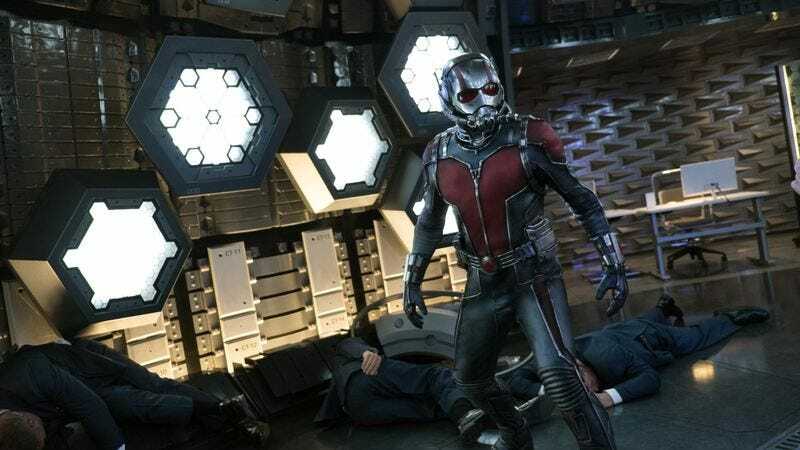 Though partly overshadowed by the very public departure of original director Edgar Wright, Ant-Man stands apart from the rest of the Marvel pack simply by being small. A sci-fi caper movie about an inventor who drafts a thief to steal a knockoff of his shrinking technology before it falls into the wrong hands, it feels a world away from the cross-cut planetary peril climaxes that have become the studio’s default mode. Even its humor—usually seen as one of the stronger points of the Marvel house style—is different. Though some viewers may find themselves playing spot-the-author with the patchy script (e.g., a fight scene gag involving The Cure’s Disintegration, which smacks of Wright), it still makes for an enjoyable, intermittently inspired effects-driven comedy and a welcome antidote to the over-burdened world-saving that seems to define big-screen superhero stories. Paul Rudd stars as Scott Lang, a good-hearted ex-con who’s been reduced to working fast-food jobs and sharing a dingy apartment with his motor-mouthed former cellmate, Luis (Michael Peña). Severely behind on child-support payments, Lang agrees to join Luis on one last job, breaking into the home of Hank Pym (Michael Douglas), a reclusive tech millionaire who once battled wrongdoers as a size-altering, insect-controlling superhero named Ant-Man. 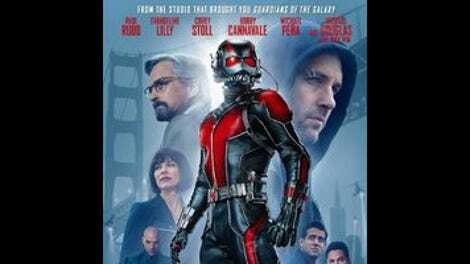 Soon, Lang finds himself roped into a scheme to help Pym and his semi-estranged daughter, Hope (Evangeline Lilly), break into the headquarters of the company Pym founded in order to prevent former protégé Darren Cross (Corey Stoll, doing his best Miguel Ferrer) from re-creating the Ant-Man shrinking suit and mass-producing it as a weapon. Hydra and S.H.I.E.L.D.—the fictional warring agencies of the Avengers-centered Marvel screen universe—are involved, though they might as well be the Soviets and the CIA; in stretches, the movie feels more like a high-concept Chevy Chase flick than a Marvel stand-alone. Extravagant special effects are taken for granted in superhero movies, but Ant-Man has enough imagination to make them seem both fun and necessary, whether it’s during a scene where the shrunken Lang finds himself dodging Lucite heels on a dance floor or in a psychedelic, space-folding sequence set in the Microverse, the dimension of the sub-atomically small. Lang, dressed in the red-and-black high-tech Ant-Man suit, faces a parody of big-screen destruction in an architectural model, dukes it out with the big bad inside a tumbling briefcase, and dodges a creepy, eye-swiveling Thomas The Tank Engine on a train set. It’s fitting that a movie that flaunts its reduced scale should build toward a climax set entirely inside a suburban bedroom. Director Peyton Reed (Down With Love, Yes Man) shows a knack for managing and integrating effects, though he occasionally seems thrown by the movie’s competing comic sensibilities, which swing from improv-esque deadpan (Adam McKay assisted with rewrites) to complicated audiovisual gags, like the montages that accompany Luis’ convoluted explanations of basic plot points. Both approaches yield their share of funny stuff, bolstered by good casting that ranges from Judy Greer and Bobby Cannavale as, respectively, Lang’s ex-wife and her cop fiancé, to cameos from Gregg Turkington and the voice of Tom Kenny. Still, it makes for some occasionally uneven storytelling; it’s only during the extended effects-heavy sequences that Ant-Man feels like a movie in control of itself.